In early February, two essential supply chain management manuals – Procurement Procedure Manual and the Supply Manual – were formally launched at the Bangladesh Ministry of Health and Family Welfare (MOHFW). Key leaders in attendance included the ministry’s Senior Secretary Mr. Md. Humayun Kabir, USAID/Bangladesh Office Director Mr. Gregory Adams, and Additional Secretory of Development and Medical Education Ms. Aktari Mamtaz. The Director of Logistics and Supply from the Directorate General of Family Planning (DGFP), Mr. Md. Kafil Uddin, gave a welcome address where he expressed whole-hearted satisfaction that stock-outs of commodities, including contraceptives since 2010 have not been an issue. He emphasized that the procurement and logistics management systems in Bangladesh have vastly improved and increased in effectiveness and efficiency. Mr. Md. Saiful lslam, Additional Director of the Central Warehouse, also from DGFP provided an overview of the Supply Manual, saying that the demand for the revision of the manual emerged from users at all levels better incorporating updated procedures, systems, and good practices. But what are these specific manuals and why are they integral to the health system as a whole? The SIAPS Bangladesh team provides answers to these questions. 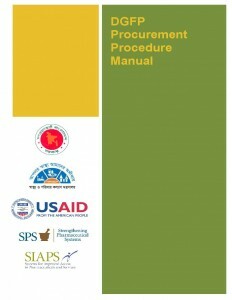 What are the Procurement Procedure Manual and the Supply Manual? The Procurement Procedure Manual (PPM) is a quick reference book to provide instructions and guidance on policies, procedures and practices in procurement for all officials dealing with procurement of medical goods and services. The manual is already being used by DGFP officials involved in procurement as a quick reference guide. Whereas, the Supply Manual is the only job-aid for the DGFP relevant to staff to ensure effective logistics management relating to warehousing, inventory and distribution systems at all levels. Why are they needed in Bangladesh? Procurement of medical products is a specialized area that requires a high degree of knowledge and skill from those who are engaged in the process. Even though procurement performance has shown strengths in the DGFP, a critical amount of procurement specialists have not had access to needed guidance. The reason is that it is very difficult for any official dealing with procurement in the DGFP to go through scores of documents that guide practices in order to perform day-to day activities. This is why this PPM has been designed specifically for procurement personnel of the DGFP – to use as a quick, convenient, and efficient reference guide. On the other hand, the Supply Manual accumulates the necessary information for common understanding of the DGFP responsibilities for good warehousing and distribution practices, specifically of family planning commodities. It also provides guidance to ensure an effective logistics system is in place at all tiers of the DGFP. What is their importance and how do they fit into the health system? The objective of the PPM is to ensure public resources are implemented with attention to economy, efficiency and transparency in procurement management. By using this reference book, the MOHFW improves the institutional and human capacity to be better prepared and empowered to identify and overcome procurement bottlenecks and challenges. It also envisions that the manuals would facilitate the attainment of value for money in the procurement process through solicitation of bids from all eligible sources ensuring governance, accountability and transparency in the public sector. Meanwhile, an effective and efficient supply chain management system is addressed in the revised DGFP Supply Manual. The integrated network of activities that move products from the central level to the end user should do so at the right time, in the right place, with good quality and the proper quantity medical products, as information is transferred at all levels of the supply system—which is crucial to sustain and expand program capacity, improve patient outcomes and save lives. The Supply Manual is a tool which can be used to enhance quality of products and improve cost effectiveness by reducing losses due to overstock, wastage, expiry, damage, pilferage, and inefficiency. The SIAPS Program worked with the Bangladesh MOHFW to update and publish the two manuals to be made available to all supply chain staff at different levels of the system.